Our adventure today was to Margaret Island by way of the Parliament building. What a grand building it is! It can be seen in yesterday’s pictures on the other side of the Chain Bridge in Buda, as well as the three-way Margaret Bridge in the background. The bridge crosses the Danube and is also connected to Margaret Island, which sits in the middle of the Danube. The park is full of trees and landscaped parks, but also has medieval ruins. The Knights of St John settled on the island in the 12th century. A feature of the park is a water fountain which is coordinated to music. On the way back, we walked on the other side of the bridge so that we could get clear pictures of where we were yesterday. After a cheap and cheerful lunch we headed back across the Chain Bridge to a gourmet store to buy a load of sweet and hot paprika. Lots of folks and groups were still going back and forth across the bridge. The late afternoon light lit up the Parliament building and the Margaret Bridge, so out with the camera for some more shots. We found out that the tourist area leading to the bridge was not the place for traditional Hungarian food, other than Goulash soup. The Hungarian area is located close to where we’re staying, just a few streets back, so that’s where we are headed for our last dinner in Budapest. But alas traditional Hungarian food is harder to find than we thought. We were looking for stuffed cabbage, chicken paprikash, goulash, and dobos torte (pronounced dobosh). Restaurant after restaurant said sorry. One person we asked said, “You have to cross the Chain Bridge and go two bus stops to a traditional Hungarian Restaurant”. Finally, one person we asked told us there was a place just down the street called Puly, like the dog. They had chicken paprikash with buttered dumplings so we sat down and placed our order. It was good but not great. My mother made it better and I could also. I get the impression that many consider it peasant food and have gone uptown with their menu. Too bad. We wanted traditional food and what we saw wasn’t. 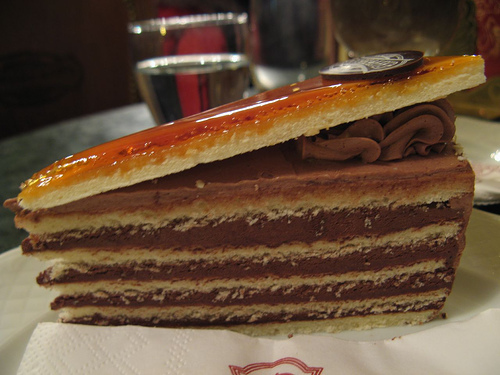 My mother made an incredible dobos torte and would make it for me for very special occasions. It took a lot of time to prepare with five layers of buttercream icing, six thin cake layers and a hard caramel toffee topping. Its inventor, Jozef Dobos, first introduced it in 1885 at the National General Exhibition of Budapest. It is simply delicious.